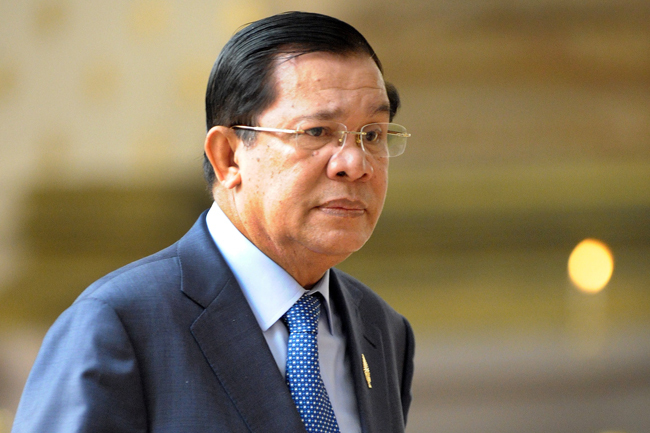 Cambodian Prime Minister Hun Sen walks into a National Assembly meeting in Phnom Penh, March 19, 2015. Political tensions increased in Cambodia this week, with opposition lawmakers boycotting a session of the country’s National Assembly on Monday and ASEAN parliamentarians voicing concerns over the country’s “deteriorating political climate” as the ruling Cambodian People’s Party (CPP) asserts ever-tighter control over the Southeast Asian nation. Recent moves by the CPP to oust senior opposition Cambodia National Rescue Party (CNRP) figures from their posts in parliament, together with physical assaults launched against CNRP lawmakers, have “contributed to a deteriorating political climate in Cambodia,” ASEAN Parliamentarians for Human Rights (APHR) said in a Nov. 30 statement. Prospects for a democratic future for Cambodia are now at risk, APHR said. On Nov. 16, CNRP leader Sam Rainsy was forced from parliament by CPP lawmakers after a warrant was issued for his arrest in a seven-year-old defamation case, while CNRP vice president Kem Sokha was removed two weeks earlier from his post as first vice president of the National Assembly in a CPP-dominated vote from which his party abstained. Two CNRP lawmakers, Nhay Chamreoun and Kong Sophea, were meanwhile attacked by government-linked thugs after a meeting in parliament on Oct. 26. Those events were not isolated, “but appear instead to be part of a broader effort by the ruling party to undermine and dismantle the opposition,” APHR Chairperson and Malaysian MP Charles Santiago said in a statement. “These politically motivated decisions confirm the extent to which the legislative and judicial branches in Cambodia are regularly used as tools of the Prime Minister and his cohorts to threaten and silence opposition voices,” Santiago said. Economic partnerships with the Cambodia government should now be reconsidered, and targeted sanctions imposed, in response to the ruling party’s actions, APHR said. Rejecting the ASEAN statement, CPP spokesman Sok Ey San said on Monday that Cambodia would not respond to criticisms voiced by foreign countries in order to secure financial aid. “Whatever they want to cut, they can cut,” he said. “We are an independent country with its own integrity, and we do things according to our own laws,” he said. On Nov. 30, CNRP lawmakers boycotted a morning meeting of the National Assembly, vowing not to return until their physical safety can be assured. “The situation is not normal, so we are not going to do our work as normal,” party leader Sam Rainsy said from France, according to a Nov. 30 Cambodia Daily report. “We want to ensure our security and safety … because there is no sign of a serious investigation into the [Oct. 26] assaults,” he said. A Cambodian court on Nov. 30 meanwhile dismissed an appeal by jailed opposition senator Hong Sok Hour, saying he must comply with an earlier order to hand over his laptop computer and other evidence required by a lower court in a now-stalled trial against him. Speaking to reporters following the court’s announcement, defense lawyer Choung Chou Ngy said the judge’s decision reflected bias against his client. “When this started, he said that the appeal was issued in correct form and in good order, and this decision now shows he had already formed a judgment [in the case],” Choung Chou Ngy said. “He didn’t listen to any of the points that our defense team raised,” he said. Hong Sok Hour was arrested by Cambodian police on Aug. 15 after Prime Minister Hun Sen accused him of treason for posting on Facebook a disputed diplomatic document, later shown to contain inaccurate wording, relating to the country’s border dispute with neighboring Vietnam. On Oct. 7, the Phnom Penh Municipal Court indefinitely postponed Hong Sok Hour’s trial on charges of “forgery and incitement,” prompting rights groups and the lawmaker’s wife to call the move—and his subsequent return to prison without bail—a violation of his right to fair and timely proceedings. Speaking to reporters on Monday, Am Sam Ath, senior investigator for the Cambodian rights group Licadho, described the Nov. 30 dismissal of Hong Sok Hour’s appeal as the latest in a series of “back and forth” moves in a case widely regarded as political. “We already knew that this case is considered political in the national and international communities,” Am Sam Ath said. “It is like tossing a ball back and forth at each other while waiting for political negotiations,” he said. Tensions showed no signs of abating on Tuesday, with the municipal court in the capital Phnom Penh issuing arrest warrants for Sam Rainsy’s Facebook manager, Sathya Sambath, and for former assistant to Hong Sok Hour, Ung Chung Leang. The two were accused of conspiring to falsify public documents, making use of false public documents and causing threats to social stability. Reported by Morm Moniroth, Yang Chandara, and Khe Sonorng for RFA’s Khmer Service. Translated by Pagnawath Khun. Written in English by Richard Finney. '...CPP spokesman Sok Ey San said on Monday that Cambodia would not respond to criticisms voiced by foreign countries in order to secure financial aid. The same attitude like Pol Pot. He didn't care to criticisms because he got China, who supported and encouraged Pol Pot reign of terror. China kept feeding Pol Pot while Pol Pot continued his "Killing Field." Well, Well Mr Hun Sen knows no one can do any thing to his party or him for that reason that why he did it. Be a shame of yourself as a donor that let Mr Hun Sen thinks all of you that way. Im a good liar and I can force the law to conform to all my lies. I'm the best at this and all you coward Khmers can kiss my Viet behind.